Make sure all ingredients for punch are cold. Freeze the vodka. Pour red cranberry juice into glove and twist and tie with a rubber band. Freeze for at least 24 hours. It needs to be frozen very hard. Drain the lychees and carefully insert one grape into each where the pit used to be. If you want to do this ahead of time, put them in a bowl and cover with one of the ingredients of the punch (or a mixture), to keep moist in the fridge. 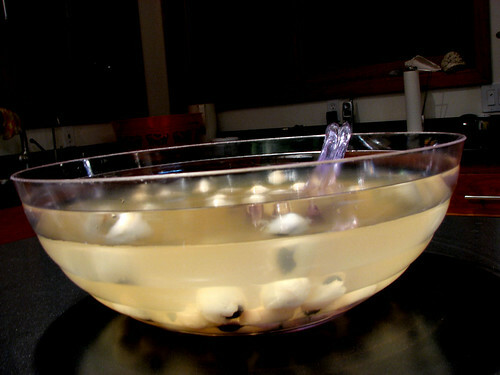 Mix ingredients for punch in a large, clear punch bowl and add the eyes. When the first guest arrives, snip the plastic glove off of the hand and float it in the punch bowl. 3/4 cup whole blanched almondsPreheat oven to 325° F. Combine dry ingredients. Lightly grease a cookie sheet. In a large bowl, beat together butter, sugar, egg, almond extract and vanilla, beat in dry ingredients. Add a small amount of green food coloring and then a drop or two of red food coloring and blend to desired color. (The red makes the green not so bright, but more muted and gross looking.) Cover and refrigerate dough for 30 minutes. Working with one-quarter of the dough at a time and keeping remaining dough refrigerated, roll heaping teaspoons full of dough into finger shape for each cookie. 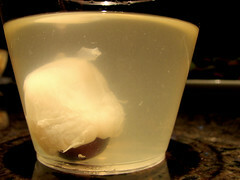 Press an almond firmly into one end for nail. Squeeze in center to create a knuckle shape and use a paring knife make slashes in several places to form knuckle. If you want to paint the nails, use some red food coloring that’s been diluted with water and brush on with a clean artist’s brush. This entry was written by plutoniclove and posted on October 31, 2007 at 2:44 pm and filed under Appetizers, Eating In, Snacks, Sweet, Vegetarian. Bookmark the permalink. Follow any comments here with the RSS feed for this post. Post a comment or leave a trackback: Trackback URL. Eeek! 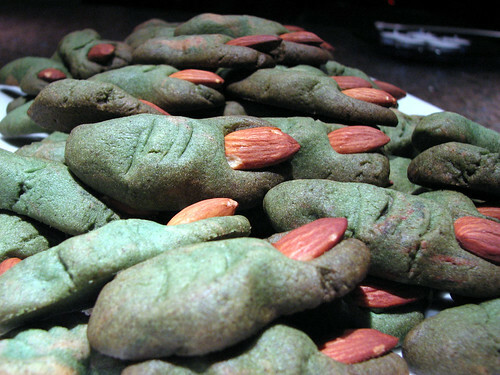 Scary looking stuff, but I’ll bet it tastes pretty good! Gawd that punch looks disgusting! No details on the kitty litter cake? How can you leave us hanging like that?? Hi Maia – Those “eyeballs” crack me up! I hope the thesis turns out well. I missed this blog. Glad I didn’t give up and kept on checking regularly so I found your last post! I found your blog while doing a Google search about ants on zucchini plants (I guess they’re fine?) and after bookmarking pretty much every recipe you have on here, I just decided it would be faster to bookmark the whole blog. I rarely use recipes because I like to just cook what sounds good to me, and because I don’t often find recipes that sound like my sort of food. But you cook like I cook so I can’t wait to try out some of these recipes. those fingers looks really good (in the scary kind of way…). well done! Oh my! Those witch fingers are CREEEEPY!!! So are the eyballs in the punch! Internet offers the start-up funding business which will provide. If you’re ready to stazrt an online business network operation, as far west as Louisiana.